Activity requires about 1-2 hours. Educator will need to make the link between extreme weather events and climate and climate change. Could be used as a self-directed activity. This resource is a collection of visualizations, animations, and simulations showing the characteristics of thunderstorms, tornadoes, hurricanes, and blizzards as seen by satellite images. Ample background material is provided with these visualizations, as well as in other modules in this course. Comments from expert scientist: This activity identifies observations, facts, interpretations and hypotheses. It also presents valid and accurate concepts, models, and skills. The data sources are clearly identified. Overall, this is very scientifically strong. I also think students will be very interested in the topic(s). This is an excellent way to learn how to observe extreme weather patterns form satellite images. 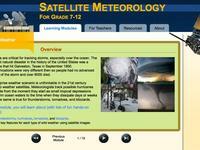 The resource includes a number of quizzes using satellite images, and a set of assessment questions. Embedded animations and interactives are effective in augmenting and illustrating important weather concepts. Some of the images and interactives are large and take some time to download onto the webpage. User interface is cumbersome and not easy to navigate. Java plug-in required for many of the interactives. MS-ESS2.D2:Because these patterns are so complex, weather can only be predicted probabilistically. MS-P4.2:Use graphical displays (e.g., maps, charts, graphs, and/or tables) of large data sets to identify temporal and spatial relationships.